Do you feel like you are working in a bubble doing the work you feel like you are supposed to do, but don’t really want to do? Joe Pardo, wants to inspire you to burst that bubble despite the safety you think it provides. We discuss how to find yourself by designing your own work. The more I do these interviews, the more I have come to realize that one of the most effective ways to get to know yourself and your capabilities is through work. Joe left the safety of his family’s business to go out on his own to find work that was aligned with his values, needs and abilities. He launched a number of different businesses including a podcast, business development retreats and web design. You can learn more about his work at superjoepardo.com. And I recently caught up with Joe at the Podcast Movement conference in Philly and he told me he’s going back to his family business, but on his terms by starting a new franchise business for them. How Joe dealt with burn out after leaving his family business. Trying out different career options to see what fits for you. Start by figuring out what you don’t want to do. 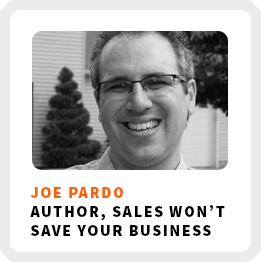 Joe shares the two biggest reasons why focusing on your sales won’t save your business. In fact, he recently wrote a book called, Sales Won’t Save Your Business. If you’ve been a regularly listen of lifeskillsthatmatter thank you so much for your support! If possible, we’d please consider leaving us a review on itunes or stitcher, so we can reach even more people interested in working on their terms. Core work activities + habits: 1) Creating content. 2) Reaching out and getting to know new people. 3) Meditating through running. Ideal work environment: Depending on the task, it could be in the morning or at night. Regains focus by: Listening to music. 90-day goal: To book up his Super Retreats. 1) Ask yourself, “how I do make this work for me,” rather than finding excuses to why you can’t do something. 2) Do an experiment to at least start taking action.